Several 5th and 6th graders gathered in the library to discuss this month’s book club book: The Magic Misfits by Neil Patrick Harris. Students admired the main character, Carter, who pledges to never steal anything, even though he is in the most desperate situation, with no family and no place to live! Students learned several of the magic tricks from the story and amazed their friends with their magic skills! Book club readers loved the Magic Misfits (Book #1) and wondered: Will Carter and his 5 Magical Misfits stay together? Read Neil Patrick Harris’ next book, The Second Story (Magic Misfits #2) now available at the TES Library. December’s book will be Restart by Gordon Korman . Join us in the TES Library on Wed. Dec 5th ( 12:15 – 12:45 pm)! On Thursday, Nov. 29th, TES is looking forward to meeting author/illustrator, Erin Rounds. 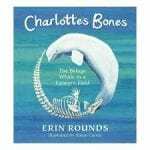 Erin is a Hanover High School graduate who currently teaches 4th grade in Springfield, VT. She will be presenting her two new books, ​Charlotte’s Bones​ and ​Where’s Winter​? at TES to all grades K-6th. Erin Rounds book Charlotte’s Bones tells the story of the Vermont state fossil. How could a whale’s skeleton have been buried in Vermont, so far from the ocean? How was it discovered? Where’s Winter? tells the story of Bear, who wakes up from hibernation, only to find that winter never came. The air is warm, but unlike in spring, there are no blooming flowers, no honeybees making honey, and no berries or nuts to eat. Where’s Winter asks children what they can do to help Bear and our planet by making personal changes to help stop global warming. A fun, inspiring book for ages 6-10. To pre-order from the Norwich Bookstore, please return the order form and payment to your child’s teacher by Friday, November 9th. Books will be delivered to the school for signing and pickup. Wow, what a great summer! I hope you enjoyed your time off from school and spent some time with family and friends. We had so many hot days! Did your family take any trips to a lake, river, or maybe even the ocean? Summer is always a nice time to read, perhaps you visited a library or a local bookstore? Maybe you found a few books to read from your very own book collection! What did you read this summer? It’s very exciting starting a brand new school year with you! 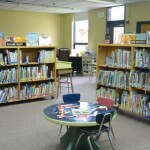 We’ll be reading and choosing books to borrow and take home to enjoy. Maybe some of you will meet Sir Earl this year; he loves to celebrate birthdays and reading. This year’s Literacy Week was so much fun! We have 5 fun-filled days planned! Students may choose a costume based on a book character from a favorite book. Nothing too fancy! 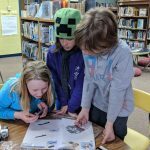 During Mud Season Madness, a Maker Class was offered in the library. In this class, students made robotic hands out of paper, parachute chord, and straws. 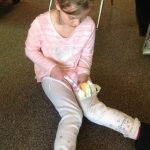 To begin their project, students first identified several essential parts of the hand: bones, joints, muscles, nerves, vessels and tendons which tie all of the parts together. They also learned about existing health technology like motorized wheelchairs, hearing aids, prostheses (artificial body parts), and artificial implants and discussed how future technologies may replace more and more of the human body. The students were challenged to assemble their robotic hands and test its construction by picking up and holding a ping pong ball. Check out our new library books! This year, on Read Across America Day (March 2nd), we are calling upon our educators and supporters to share which childhood book meant the most to them. To participate, simply take a picture with the book of your choice and post your “shelfie” on a public social media platform. When you post your photo using #Shelfie and #ReadAcrossAmerica we’ll share your creative submission on our social channels and feature it on our website. During library class, 5th and 6th graders have been learning about renewable energy and the newest technologies we have available. 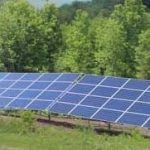 They have been looking at data from Thetford Elementary’s 148.8 kW solar array and analyzing its lifetime energy. The 6th grade is planning a library/classroom field trip with one of the engineers from Norwich Technologies. Students are looking forward to seeing the array close-up and having their questions answered by a solar expert. When Robots Join the Library…..
Students in 4th, 5th, and 6th grade have been volunteering to come to the library during their recess to assemble and program robots. The 5th grade group assembled a robot, TRACK3R. These students thought it would be valuable to teach Mrs. Porter’s class what they had learned so far. Mrs. Porter’s Kindergarten and 1st grade students loved learning from other TES students and were a very attentive audience! The 5th graders now want to begin assembling a 2nd new robot, R3PTAR. They plan to return to Mrs. Porter’s class in a few weeks, to once again share what they have learned with others!